NB. All photographs on this page are the copyright of Trevor Matterson and may not be used without his permission. 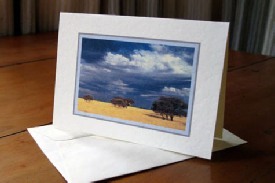 These note-cards are printed on high quality cream coloured textured board with appropriate borders around the pictures. They are blank inside so that you can create your own message. The folded size is 105mm x 150mm and they come with matching C6 envelopes. They are packed in clear protective pockets. They are available as single cards or sets of your choice.